As has been the case for the past year, worries over global growth continue to dog markets. Last Friday’s large miss on Germany’s purchasing managers index is more evidence that global growth has turned sour (Chart A, below). Some hoped that a better result would be seen from Germany given that order rates have held up. However, the 44.7 reading on the index is far below 50, creating cause for further concern about Europe. The miss follows earlier warnings on growth from the European Central bank, who recently issued a cut to their outlook. 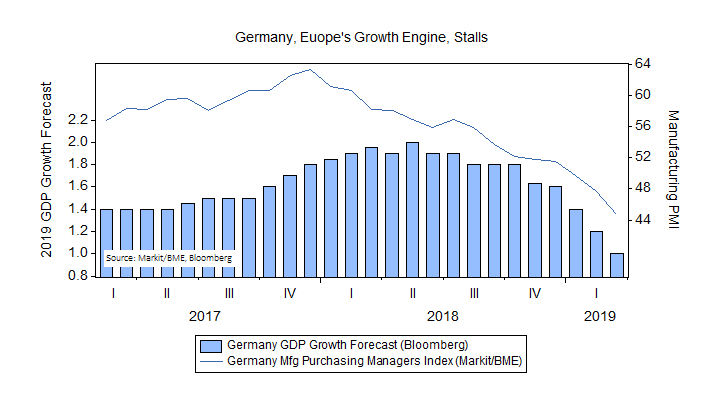 Bloomberg’s estimate of 2019 German growth is now down to 1% from 2% a year ago (Chart A, below). German bunds rose, and yield fell, driving the 10-year German yield back into negative territory. The U.S. is weaker, too. After averaging 2.9% growth last year, the Federal Reserve Bank of Atlanta’s GDP Now Forecast calls for just 1.2% growth in Q1 2019. What’s more, the spread, or difference, between the 3-month and 10-year U.S. Treasury yield turned negative last week. This phenomenon, known as “inversion”, is worrisome because it was seen before each of the past seven recessions (Chart B, below). While there are instances where the curve temporarily inverted with no ensuing recession, it is not likely to go unnoticed. Another area of potential concern is future earnings growth. 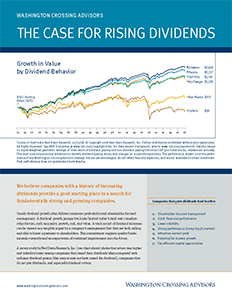 While earnings have grown rapidly and companies remain very profitable, earnings growth is slower. According to FactSet Research, S&P 500 earnings are expected to decline 3.6% in the first quarter. Bloomberg is reporting that S&P 500 earnings forecast over the next 12-months is now $171.62 versus $174.92 back in December. 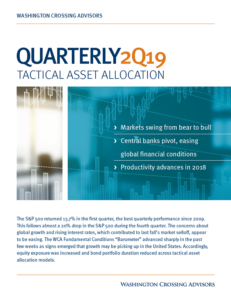 While neither the growth slowdown or trimming of expectations is especially worrisome, especially following a period of strong increases, the lack of near-term growth makes the near-term bull case for stocks that much harder to make. If this marks the end of the rate cycle, it would mark an exit from tightening at a point where real rates are still very low. If we subtract expected long-run inflation from the policy rate, for example, real rates are just 0.25%. By comparison the high water mark for real rates reached 2.75% and 4.00% at the end of the last two cycles in 2006 and 2000, respectively. This points to the possibility that the Federal Reserve will have less latitude to cut rates if a recession was to develop. Normally, a dovish decision by the FOMC, such as last week’s, would be met with a rally in stocks and a fall in bonds. That was not the case last week as the major stock indices lost ground, bond prices rose, and yields fell. Although things continue to weaken, policy actions could enliven growth. While we expect to see some signs of turnaround as the year progresses, we have little to point to in the current economic data. Until we see tangible signs of a turnaround, it will be difficult to build a compelling near-term argument for stocks.